The last time Disney decided to make a movie based upon a theme park ride yielded The Country Bears, a strange, strange movie. Luckily, things are much better this time with Pirates of the Caribbean: The Curse of the Black Pearl, a rousing, swashbuckling pirate epic. This is the first time that Disney has released a PG-13 rated film under their Walt Disney Pictures imprints, ratings like these usually go to Touchstone. That being said, Disney partnered with uber-producer Jerry Bruckheimer, and Pirates, with its constant action and love of explosions and fast editing feels more in line with his work than with Disney's. So how well did the ride transform into the film? Aside from the name and a few sly references, the two have little in common, which is probably a good thing. The success of the film relies on three main elements: director Gore Verbinski, star Johnny Depp, and screenwriting team Ted Elliott and Terry Rossio. Depp (Lost in La Mancha, From Hell), because he has the lead role, is the most visible aspect of Pirates. He throws himself into the role of Captain Jack Sparrow, a disgraced pirate captain seeking to regain control of his boat, the Black Pearl. Sparrow dresses flamboyant, almost androgynously, and speaks with his hands, and acts like he's somewhere between insane and drunk. He's got beads in his hair, gold teeth, thick eyeliner, and a braided beard, and lots of personality to match. It is a mesmerizingly weird performance, and hard not to watch just to see what he'll do next. He agrees to look for the Black Pearl with Will Tanner (Orlando Bloom, The Two Towers, Black Hawk Down), a lowly blacksmith who desires to rescue the fetching Elizabeth Swan (Keira Knightley, Bend it Like Beckham, The Phantom Menace). He has pined after her for years, and she feels the same way about him, but a wedding between her and British Commodore Norrington (Jack Davenport, Gypsy Woman, Look) seems inevitable. 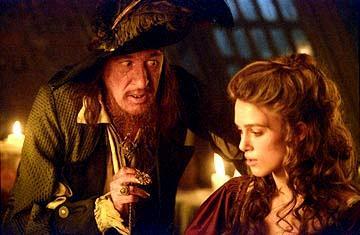 Elizabeth has in her possession a gold coin with a skull on it that Captain Barbossa (Geoffrey Rush, Finding Nemo, The Banger Sisters), the current Captain of the Black Pearl desperately wants back. He kidnaps Elizabeth, and Tanner and Sparrow soon follow. The coin is key to absolving a curse upon Barbossa and his crew. Elliot and Rossio (Treasure Planet, Shrek) concoct an exciting yarn, full of quips and lots of self-deprecating humor on Depp's part. Story credit also goes to Stuart Beattie (Shinobi, Kick) and Jay Wolpert (The Count of Monte Cristo). Pirate movies are not easy to write, as then tend to turn off audiences for whatever reason. The script here is peppy, moves quickly, and has enough jokes and action to satisfy even the most ADHD-addled viewer. Which, finally, is where Verbinski (The Ring, The Mexican) comes in. Verbinski is an able, if not anonymous director. In other words, he has yet to develop any sort of distinctive style. What he does excel at is letting the script take over without getting out of control. 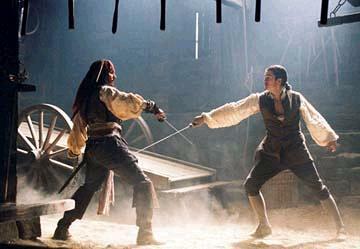 Pirates also has a sense of fun and adventure missing from many other movies. There is danger, but one never feels that the good guys will ever get hurt. This spirit, and some great acting are also enough to get past some of the logical lapses of the film (why would the British keep fighting skeletons that cannot die?). Bloom and Knightley are still at the early point in their careers, and both possess stunningly good looks that will surely help them on their way up. Pirates gives them a chance for a higher profile roles aside Depp and Rush, who looks like he's channeling some leftover de Sade from Quills (that's a good thing). Like many Bruckheimer movies, this one is pretty brainless, but it's fun at the same time. 2 hours, 23 minutes, Rated PG-13 for action/advenutre violence.